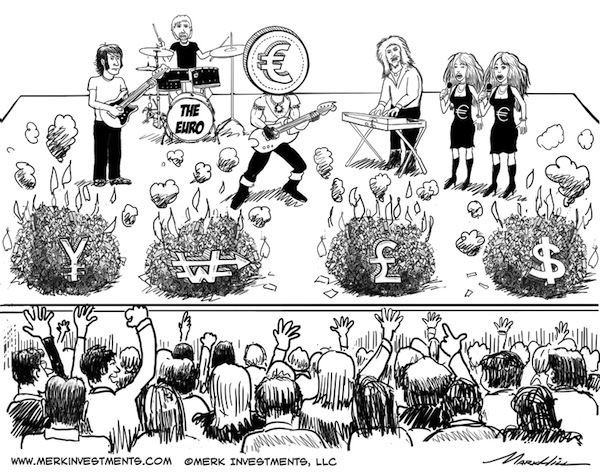 Merk Insights - Euro: Rock Star of the Year? Euro: Rock Star of the Year? After we referred to "Draghi's Genius" last August we received pity and ridicule as feedback. It is no longer taboo to be bullish on the euro, but in our 2013 outlook we took it a step further, predicting the euro will be a "rock star." Despite the recent run-up, we may not have seen anything yet. Let me explain. First, for some background, we were positive on the euro in 2010, when the currency was tumbling towards 1.18, arguing that the issues in the Eurozone were rather serious, but should primarily be expressed in the spreads in the bond markets. The euro, we argued, was sold as a proxy as it was easier to short than peripheral Eurozone bonds. Sure enough, the euro recovered to the high 1.40s while spreads were blowing out. It provided a process to move forward. One may or may not like the details of the process, but it is a process nonetheless. For all the naysayers, keep in mind that the processes in the U.S., U.K., and Japan aren�t particularly good, either. The euro took great strides to becoming �yet another currency.� That�s very good news for a currency that�s been treated like a contagious disease. The process imposed requires that weak countries would give up sovereign control over their budgeting. That was the de facto outcome of previous bailout requests as well, but a defined process is replacing chaotic action. Crises will always happen, but they are less stressful when well defined processes are in place. The fact that other Eurozone countries have to agree to help weak ones throws the ball into the court of politicians. The ECB is not supposed to be a political body and has squared the circle on this one. Many disagree with us that the ECB is truly able to stay outside of politics, but in our assessment, the ECB is better positioned to deal with political pressure to finance deficits than the Federal Reserve, Bank of England or Bank of Japan. Not to be ignored, Draghi did remove significant �tail risk�, making it much less likely that we will see liquidity driven defaults. I�m treading carefully here in how to express this, as I believe the essence of many of the Eurozone policies is to eventually have markets strong enough to stomach sovereign restructurings. As such, I�m not ruling out defaults in the Eurozone but when the time comes, the market fallout may be rather limited. In brief, the ECB promised to act more like other central banks if Eurozone countries acted more like a United States of Europe. This does not mean everything is well in the Eurozone. The lack of further progress is mostly due to some slacking off as bond market pressure has abated in the periphery. A scandal alleging that Spanish Prime Minister Rajoy has taken bribes is a symptom of how fragile peripheral Eurozone countries continue to be. Few tears should be shed if Rajoy loses his job over the issue, as we believe he squandered the opportunity to engage in real reform with the absolute majority he has enjoyed. Similarly, Italy�s next government is likely to be weak as populist politicians continue to be on the rise. As a result, the tone at the beginning of this week is a more somber one after euphoria of late. We call it profit taking. Clearly, the ascent of the euro won�t be a straight line. So what may drive the euro higher from here? For those that didn�t notice, the euro ended up almost 2% versus the U.S. dollar in 2012. That�s how great the greenback performs in a year that pushed the euro to the brink. Wait to see what the euro can do in a year where things are actually improving. Continued normalization. Central banks reduced their Eurozone holdings last year (well, not the Swiss National Bank in their effort to stem the rise of the Swiss franc). Yet, central banks are desperate to diversify their reserves. We believe the flows back into the euro will accelerate. Private sector inflows. Not many are aware that while there was a flight out of peripheral markets, the flight was generally into stronger Eurozone countries rather than out of the Eurozone as a whole. Now, however, risk friendly capital is pouring into higher yielding Eurozone debt. Investors are lining up to step in where banks are unable to finance their clients. There�s demand to invest in the Eurozone. The Federal Reserve continues with its amazing balance sheet expansion, we call it money printing, at a net rate of approximately $1 trillion a year. The Bank of Japan (BOJ), similarly, is committed to printing money. At this stage, the programs are stated on a gross basis, giving them less umpf than they appear to have at first sight. But fear not, the governor of the BOJ is retiring in April; the two deputy governors retire in March; the dissenters in the recent easing announcement were recently appointed governors calling for more easing. For more background, read our November analysis "Is the Yen Doomed?" Mark Carney, current head of the Bank of Canada will become head of the Bank of England. Carney is in a most unusual situation, in that he can trash talk two currencies at once right now. He appears to be eager to be far more aggressive at the Bank of England, talking about nominal GDP targeting and how there�s plenty of firepower left at the central bank. This may bode rather negatively for the British pound (but also positively for the Canadian dollar once his successor emerges at the Bank of Canada). Maybe most importantly, the ECB has been mopping up liquidity. The ECB balance sheet is demand driven, providing liquidity to those that post collateral. As banks have started to pay back the �1 trillion in 3 year loans (LTROs) early, a balance sheet contraction � the colloquial reverse of printing money � is accelerating. I say accelerating because the ECB balance sheet had already been contracting. Correct, the ECB is tightening when all the other big central banks are continuing to ease. Violent profit taking / snapback rallies may occur. Indeed, we expect volatility in all markets to continue to be elevated. The ECB could lower interest rates. We believe the reason the ECB has not lowered rates is because much of Northern Europe had de facto negative rates. The �narrowing of spreads� in the Eurozone fixed income markets have also caused significant upward pressure on yields in the stronger countries. In a few weeks, possibly months, it might make sense for the ECB to lower rates. At this stage, however, the narrowing of spreads is a substantial stimulus to the Eurozone as a whole; we don�t expect the ECB to rush to lower rates. And when the ECB does, it may well be received as stimulus that�s not euro negative as it promotes growth (it won�t stop pundits from lamenting that the ECB is �behind the curve�). Intervention risk. In an age of currency wars, what about the ECB intervening to weaken the euro? First of all, I would call intervention in the euro more an opportunity than a risk, as it would put the currency on sale. Maybe more importantly, in our experience, calls for interventions in the euro tend to come after a long, gradual rise. When the rise is rather abrupt, it catches corporate executives by surprise. Folks are scratching their heads, they are hedged, they are glad the crisis appears over; with the exception of a retiring politician here or there, the calls for intervention may be more fringe talk than substance. Having said that, Draghi may well take an opportunity here or there to talk down the euro a bit. But it may be more bark than bite, as other central banks are rather glad their currencies are so weak, thus less enthusiastic to join in a coordinated intervention. What about the political risk, such as that German, Spanish or Italian elections go �the wrong way?� Clearly, we have to evaluate information as it becomes available, but the above list explains why we believe the euro is cursed to move higher. Cursed because what�s good for the euro is not necessarily good for exports from the Eurozone. How high can the euro go? That depends on how low the dollar, sterling and yen might fall. We have long argued that there was never really a Eurozone crisis; there has been and continues to be a global crisis. It focused on the Eurozone first; we believe Japan may be next, then the U.K., then the U.S. Keep in mind, though, that the U.S. has a current account deficit; as such, the dollar may be far more vulnerable to a misbehaving bond market than the Eurozone has ever been (the Eurozone current account is roughly in balance). To learn more about where we think the Euro may be heading, and how we identify currencies as investment opportunities, please join us in our webinar on Thursday, February 21, 2013. Please also sign up for our newsletter to be informed as we discuss global dynamics and their impact on gold and currencies. Axel Merk is President and Chief Investment Officer, Merk Investments.